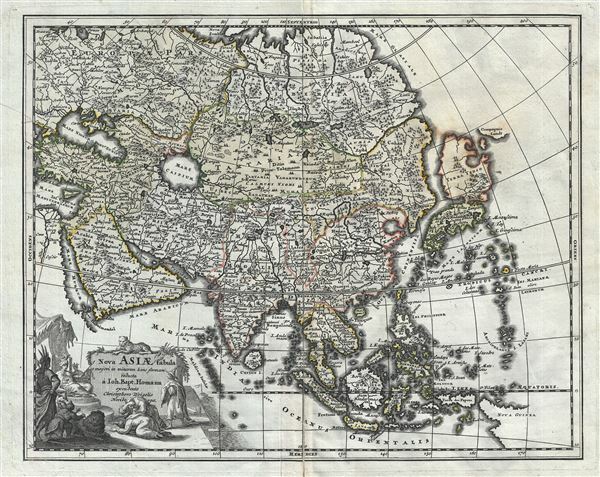 Scarce early map of Asia offering a speculative Hokkaido. Nova Asiae Tabula e majori in minorem hanc formam reducta a Ioh. Bapt. Homann excudente Christophero Weigelio Noribergae. A scarce 1719 Christopher Weigel and J. B. Homann map of Asia. Based upon an earlier map of J. B. Homan, this Weigel reduction covers all of Asia from the Black Sea to Japan and from Nova Zembla to New Guinea. There is an elaborate allegorical title cartouche in the lower left quadrant illustrating several men bowing to an Asiatic monarch. A leopard surmounts the title area. Cartographically there is much of interest, particularly in East Asia, which at the time was largely unknown to European cartographers. Japan is attached to Hokkaido, here labeled Yedso, which is itself much larger than a malformed but somewhat recognizable Honshu. Just to the east of Yedso (Hokkaido), Homann maps the apocryphal Compagnie Landt. Often called de Gamma Land or Gama, these islands were supposedly discovered in the 17th century by a mysterious Spanish navigator known as Jean de Gama. Various subsequent navigators claim to have seen this land, including Maerten de Vries and Cornelis Jansz Coen, but it was left to Bering to finally debunk the myth. In 1729, he sailed for three days looking for Juan de Gama land but never found it. Thought it may be little more than a mis-mapping of Hokkaido or the Japanese Kuriles, Gama or Compagnie remained on maps for about 50 years following Bering's voyages until the explorations of Cook confirmed the Bering findings. Korea is labeled and appears in a vaguely identifiable peninsular form. New Guinea is only tentatively rendered suggesting its laregley unexplored shores. In the far north, beyond Japan, Asia is truncated indicating that Siberia remained at this point fully unknown. Near the center of the map the Capsian Sea (Mare Caspium) appears in circular form according to the 13th century Kurdish geographer Abu'l Fida. This map was reduced and revised from Homann's original by Christopher Weigel for inclusion in Johann David Kohler's 1719 Schuul und Reisen Atlas. Christoph Weigel (November 9, 1654 - February 5, 1725) was a German goldsmith, printer, and engraver based in Nuremburg. Weigel apprenticed in engraving in the publishing center of Augsburg after which he held various positions in Vienna and Frankfurt. Eventually Weigel worked his way to 18th century printing Mecca of Nuremburg where, in 1698, he became a citizen of the city and established his own firm. Weigel is known to have worked closely with the most prominent of the Nuremburg map publishers J. B. Homann as well as with with his brother Johann Christoph Weigel (1654 - 1726) and the printer, Kohler. Following Weigel's passing in 1725, control of the firm passed to his widow, who published a number of Weigel's maps and atlases posthumously. The widow Weigel eventually ceded control of the firm to her son, Johann Christoph Weigel the younger (?? - 1746) who partnered with Schneider to publish as Schneider-Weigel. The Schneider-Weigel firm continued to publish until the early 19th century. Kohler, J. D., Schul und Reisen Atlas aller zu Erlenung der alten…, 1719. Very good. A view minor reinforcements to margin on verso. Original centerfold exhibits some wear. Plate mark visible.